Join the FREE BREAKTHROUGH WORKSHOP on Saturday, June 30th from 4:30pm-6:30pm, presented by Raj Ganesh, Founder and CEO of Arise n Shine International. 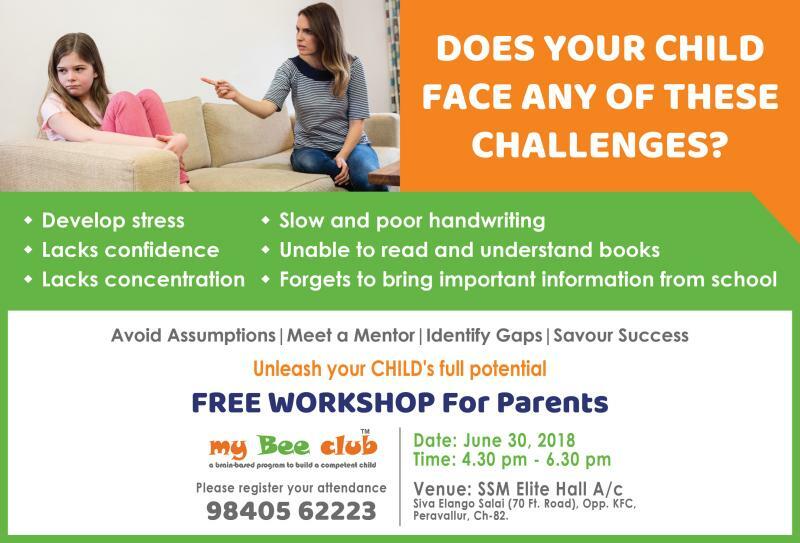 This workshop is exclusively created for parents who have these concerns and usually role model other parents or read books on how to fix them. You can’t role model other parents! The books can only provide information and not transformation! Your child is Unique! Apart from home, school is the single most important place in the lives of most children. Their experience of school will play a vital part in their lives and will determine their academic, social, emotional development and their future. So how does your child get through this phase of life? From this workshop you will learn that these are not challenges, but developmental milestones and learn specific ways to help your child develop key competencies A proven system that has transformed the lives of over 50,000 children! Venue: SSM Elite Hall A/C, Siva Elango Salai( 70 ft Road), Peravallur, CH-82. NOTE: Kindly note that this event is meant for parents. Please call 98405 62223 for FREE REGISTRATION!